Pepper Keenan: Steven J. Messina. It’s difficult enough to be a member of one metal band, let alone two. 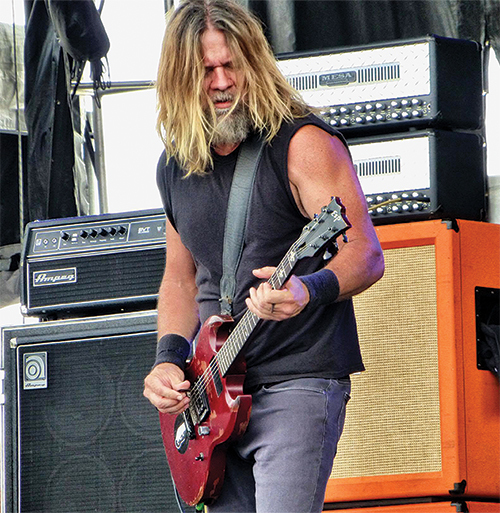 But Pepper Keenan is pulling double-duty as a member of both Corrosion of Conformity (as singer/guitarist) and Down (as guitarist). The former’s reunion certainly makes sense, as the Keenan-fronted lineup enjoyed the biggest commercial success. We spoke with him about how CoC is going about picking up where it left off in 2006. How did the idea come up to reunite with CoC? Just being on tour and hearing a lot of people asking, “When are you going to get back together?” That kind of thing. It had been a long time since I’d spoken to Reed [Mullin, drums] and then they started doing the three-piece thing. People just kind of kept the band alive and were really curious about the possibility of us playing again. We talked about it. We said, “Let’s just go to Europe, play some shows, and feel it out.” It was like riding a bike. It was really fun. And the songs really do stand the test of time. It was awesome to play them – some we hadn’t played in 20 years. It went great, so it just started rolling from there, and everybody seemed to dig what we were doing. How is it playing in the band now compared to the first time around? We’ve all matured a bit. We’re not necessarily better (laughs), but we’re playing better. It’s just really fun. It’s bizarre when you go back and play songs you wrote a long time ago, and you wonder, “How the hell did we write this thing?” It’s always fun to go back and do that. Playing-wise, it’s been a blast. What can fans expect from the forthcoming CoC studio album? It’s a tall order, because the last record I did with CoC was In the Arms of God, which in my opinion is about as good as I could do it. That was us at the top of our game. So, our standards are very high and we don’t take this opportunity lightly, so we’re putting a lot of energy and time into making the correct record for where we’re at right now, but going backward a little bit, too. We’re not scared to do that. I know which parts work – and how – for us. We just want to make what’s in our head – a killer classic CoC record. And with John Custer working with us, who produced all those records. He’s super-excited, too. How would you say your guitar playing differs from when you play with CoC compared to Down? Down is a little more ham-fisted, if that makes any sense. The CoC thing, obviously, I’m singing. It’s just two different animals. The Down stuff, I’m more focused on ripping guitar stuff because I don’t have to sing. And the CoC stuff is really more song-oriented. 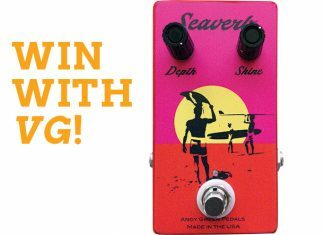 Which guitars, effects, and amplifiers do you use? Right now, live, I am using two Orange Thunderverb 50-watt heads, Orange cabinets, and minimal pedals. I got your wah, delay, a Phase 90, and an overdrive, and I can pretty much get anywhere I need to go with that small setup. And then I’ve got two ESP custom-made guitars that are like SGs. I’ve used them forever, they’re bulletproof and beat to s**t, but still play great. They’re based on one of my favorite Gibson SGs, just made thicker – as thick as a Telecaster. There are only two of them. What does the thickness add to the instrument? It’s just sturdier, and I really wanted to put the jack upside-down on the side of the guitar, so it came up by the strap. I had them use a Strat-style input jack, so it goes up and over the strap. On some of the Gibsons, it comes out the front, and I break them all the time. I played SGs so long and thought, “How can I make it better for me?” We also moved the pickup selector out of the way and put the Volume knob in a different spot – closer to the strings, like a Stratocaster. Which album of your entire career is your favorite from a guitar-playing standpoint? It would be two of them. In the Arms of God, guitar-playing-wise, is pretty damn epic. And the Down stuff… Down II has some pretty crazy guitar s**t on it.